ABC challenge: iRis 10 | Light Your Nails! Short post for me today because I am quite late. Today’s letter for ABC challenge is "i". For the occasion I picked up an unknown brand that has been sitting in my drawer for ages. It says it’s made in Turkey and that’s all I know about it. iRis n. 10 is a yellow creme filled with golden specks. Its look is a bit weird because from some angles it looks like there’s some dust trapped underneath the surface. That’s how the speckles look at times, which is not a good thing! Other than that application was easy for being a yellow. Oggi vado di fretta perchè è già abbastanza tardi. La lettera di oggi per il percorso ABC è la “i” e per l’occasione ho scelto un marchio assolutamente sconosciuto. E’ un po’ che possiedo questo smalto e finalmente è arrivato anche il suo turno. Dall'etichetta vedo che è prodotto in Turchia, ma è indicato anche il nome del distributore italiano, e questo è tutto quello che so in proposito. iRis n. 10 è una lacca gialla piena di particelle dorate. E’ un po’ strano perchè queste particelle da certe angolazioni sembrano polvere intrappolata nello smalto, che non è proprio una bella cosa! A parte quello si stende bene, specie per essere un giallo. From this macro shot it actually looks like a shimmer polish filled with glitters but I swear I couldn’t see that shimmer in person. That’s it today! Let me know what you think about this nail polish! Dalla macro sembra uno smalto shimmer pieno di glitter, ma vi assicuro che io questo shimmer di persona proprio non l’ho visto. Per oggi è tutto, avete mai sentito parlare di questo brand? E cosa ne pensate dello smalto? Di questo brand ho solo un bianco preso per vedere se funzionava per la water marble (NO) e abbandonato in un angolo. Comunque m'è venuta voglia di crema pasticcera (senza stafilococco, grazie)! Macro is beautiful...from distance it looks bit dull shade but I think it can be a good base for some nailart on top of it! What say? Thank you! I did some stamping over it but I am not overly fond about it. I like this yellow shade and I think it looks great on you! What a great nail polish, I like it a lot! That is a very sweet polish. I kinda like it. Yellow doesn't get enough love, this is gorgeous! I had never thought of that but now that few of you mentioned it I have to agree! Ohh it is so beautiful! I am loving those little gold flecks of sunshine popping through! Thank you Ith! They are super nice in full sunshine, a little weird in the shade! yellow is really flattering on you. I can't wait to see what sort of art you can do with this. Thank you Nichole! I love yellow but more when it's brighter! I love these kind of unusual shades - this looks great on you! 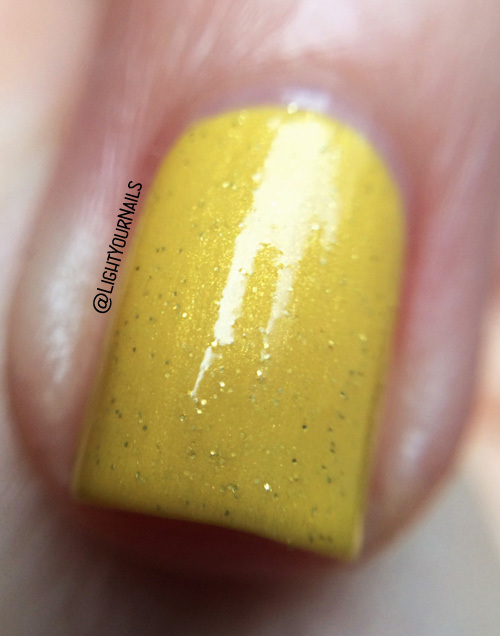 This isn't my favorite shade of yellow but I'm loving that macro! I can see how the gold specks look like dust sometimes, the golden tone is a bit too close to the yellow. Bummer, because the yellow itself looks great! I'm not normally a yellow fan but this is lovely! Ooohhhh what a yummy yellow!! I'm normally not into yellows but this is so pretty! Lo smalto è carino, sebbene sia giallo. Peccato che lo shimmer salti fuori solo all'occhio della macro! Il brand, invece, mai sentito. Magari al sole si vedrebbe... ma data la mancanza rimango col dubbio! I glitterini però si vedono bene.